The LRA is a rebel group from northern Uganda, predominately composed of child soldiers. For the last 24 years the LRA has continued to commit horren-dous human rights violations by conducting massacres, performing mutila-tions, and abducting children for to become child soldiers or rebel brides. In effort to protect the human rights of the LRA-affected communities, the US has passed the 2009 Lord‟s Resistance Army and Northern Uganda Recovery Act. 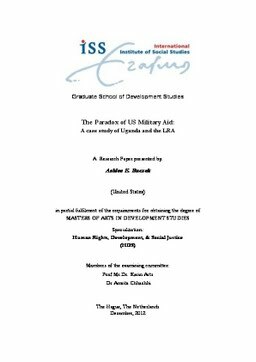 This human rights foreign policy permits the US government to provide military aid to Uganda in order to contribute to counter-LRA efforts. On Oc-tober 14, 2011, the US deployed 100 military personnel to northern Uganda in efforts to eliminate the LRA and bring an end to its human right abuses. How-ever, this research demonstrates that this means to promote human rights may actually endanger the human rights of the LRA-affected populations. This re-search presents a human rights analysis of the fundamental elements of the LRA Act to demonstrate the human rights implications of the LRA Act mili-tary aid implementation strategy.